"In this century of ours, it is an iniquitous crime... to treat matters that bore us to tears. Hence science... should receive from the industrious ingenuity of the writer some pleasing embellishment and entertaining discourse." 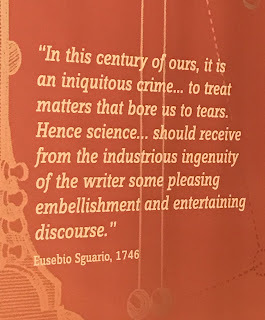 Leave aside, for the moment, the slightly archaic phrasing and think about this: almost 300 years ago, someone said that science deserves to be explored and expressed just as gracefully and entertainingly and with just as much artistry as any other subject. 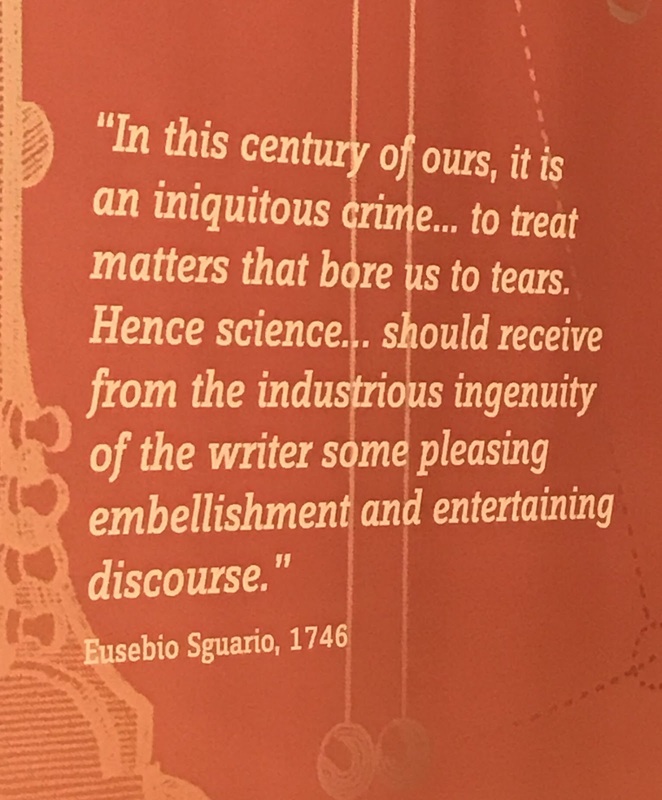 And that to give science less than its due is "an iniquitous crime." In some ways, Sguario's time was not too different from our own. Science was blossoming, coming up with new information and new approaches to understanding almost faster than people could absorb them. Astronomers were peering at the heavens through better and better telescopes. Naturalists were exploring, sorting, and cataloguing the natural world. Microscopists were staring in wonder at living things so tiny that no one had suspected they existed. And people like Sguario were applying the still-revolutionary ideas of Sir Isaac Newton to the physical world. Much of that new knowledge was unsettling. It challenged people's understanding of their world and humans' place in it. For some, that was thrilling. For others, terrifying. But information, facts, knowledge -- they're all hard to get rid of once they've been released into the wild. So it's better, as Sguario said, to use a bit of industrious ingenuity to convey that knowledge in a way that pleases and entertains as well as informs. Hakai Magazine -- a free online magazine with beautifully illustrated and beautifully written stories about the world's coasts. Ed Yong's online science stories in The Atlantic -- well-researched and always entertainingly written. Richard Flanagan's moving lament in The Guardian for Tasmania's transformation under climate change. Today, scientists are producing information even more prodigiously than were the scholars of Sguario's day. Much of that information is vital to the future of the world as we know it -- perhaps even to our survival as a species. How much more important is it, then, to employ all the industrious ingenuity we writers can muster and spread scientific knowledge through entertaining discourse and with pleasing embellishment, so that everyone can understand the forces that will determine our future? We owe it to science and -- more importantly -- to the world. 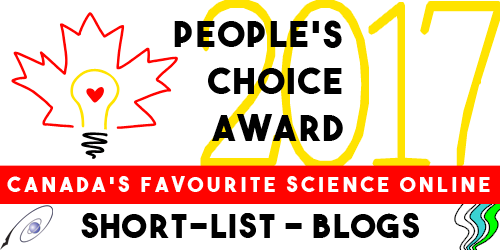 So what's that got to do with writing about science for kids, you ask? After all, that's what this blog is about. Well, kids' science writers, like the ones who write for this blog, are all about entertaining discourse and pleasing embellishment. We write about science in ways that are funny, exciting, tantalizing, often gross, and sometimes beautiful. And we apply our industrious ingenuity to presenting science as accurately as possible -- even if we're presenting it to pre-schoolers. Elin Kelsey's picture book, You Are Stardust, with delicate artwork by Soyeon Kim. Jan Thornhill's charming Kyle Goes Alone, which teaches kids about both sloths and themselves. Helaine Becker's Counting on Katherine, a picture book biography that is hitting all the science writing awards lists this year. We are all very aware that our readers are the adults of the future, and that the knowledge we can give them now -- and, more importantly, the sense that science is something they can enjoy, understand, and maybe do -- will contribute to ensuring they, and we collectively, have a future. That sounds a bit grand, doesn't it? And I guess it's a bit of a rant. But good science writing is worth ranting about. As Sguario said, it's a crime to bore your readers to tears. Iniquitous! Stephen Jay Gould's Wonderful Life, describing the fossils found in Burgess Shale, a layer of rock in a mountain near Field, BC. Oliver Sacks's The Man Who Mistook His Wife For A Hat, on observing human neurology. Rebecca Skloot's The Immortal Life of Henrietta Lacks, about the woman whose cancer cells became research material in labs around the world. But for kids, I still enjoy Eleanor Clymer's Search for a Living Fossil: The Story of the Coelacanth, from Scholastic Books. International Day of Women in Science!